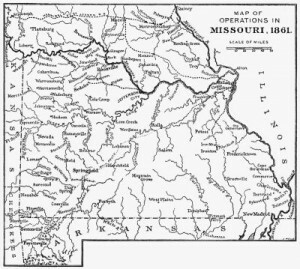 On October 21, the 20th Illinois, fighting alongside other Union regiments, had defeated Missouri State Guard Brig. Gen. M. Jeff Thompson’s 1500-man force in the Battle of Fredericktown, Missouri. A minor battle, the victory was nonetheless welcome for the United States, which is struggling to retain control of Missouri and, in the larger picture, has yet to triumph in a major battle. After the battle strict orders came down from Col. Marsh that the men were not to forage for food. However, supplies were short and many of them were hungry. They came upon a flock of sheep; the temptation was too great and soon mutton was roasting away over the campfires. Marsh came riding out and chastised them for violating his orders. They replied that they had come upon the flock, and as the sheep refused to take the oath of allegiance to the Union, they had to be disposed of. The boys of the 20th, who had joined in April, were finally preparing to see action. On October 18th they boarded a steamer, destination Fredericktown, where they hoped to capture the notorious rebel Jeff Thompson. They made camp near a southern sympathizer’s plantation house. The chaplain of the 20th called on the family, and finding they were Baptist asked if they would like a prayer meeting held in their home after dinner. To this they agreed, but unfortunately not all of the 20th were of a religious mind. While some of the men attended the prayer meeting in the home, others raided the farm stealing the family’s chickens, sweet potatoes and a good bit of their honey. When a Sergeant Bernier, who was not aware of the theft, called on the family the next day to borrow a kettle, the lady of the house thought it pretty “cheeky.” She screamed, “Some of you come here and pray, and talk very pious, while the rest steal my chickens and potatoes! And now you want my kettle!” She then attacked him with a broadside of words that we cannot repeat. Sergeant Bernier beat a hasty retreat still wondering what he had done wrong.